March Talking Points featured a heading: ‘A big shift in the economy needed – but where are the ideas?’ In June we asked: ‘Why are there no ideas “lying around”?’ With this year’s party conferences behind us, it seems like a good time to revisit the ‘lack of ideas’ issue. First, though, we should look at the context, and why ideas are so urgently needed. Globally, the situation could not be more pressing. Early in October came a stark warning from the International Monetary Fund: ‘World economy at risk of another financial crash.’ Focusing on the UK, economists Will Hutton and Aditya Chakrabortty provide lucid expositions of how we got where we are today. ‘We let finance rip and flogged our assets. Austerity was bound to follow,’ says Hutton. ‘Britain fell for a neoliberal con trick – even the IMF says so,’ says Chakrabortty. Both Paul Collier and Nicholas Shaxson see London as a big part of the problem, casting a malign shadow over the rest of the country. ‘London is not shackled to a corpse,’ says Collier. ‘The rest of the country is shackled to a shark.’ Shaxson portrays the City of London not as the goose that lays Britain’s golden eggs but as ‘a cuckoo in the nest, crowding out other sectors’. The title of a major new report from the Equality and Human Rights Commission poses the question: ‘Is Britain fairer?’ The answer is a resounding no. The report talks of a ‘two-speed society’, of a ‘divided nation’ where ‘the poor are increasingly trapped in poverty and excluded from mainstream society because of their social status’. Hope Not Hate’s new report, Fear, Hope & Loss: Understanding the drivers of hope and hate, based on six years of polling and focus groups, also talks of a divided Britain, with ‘a particular chasm between people living in affluent, multicultural cities and those from struggling post-industrial towns’. 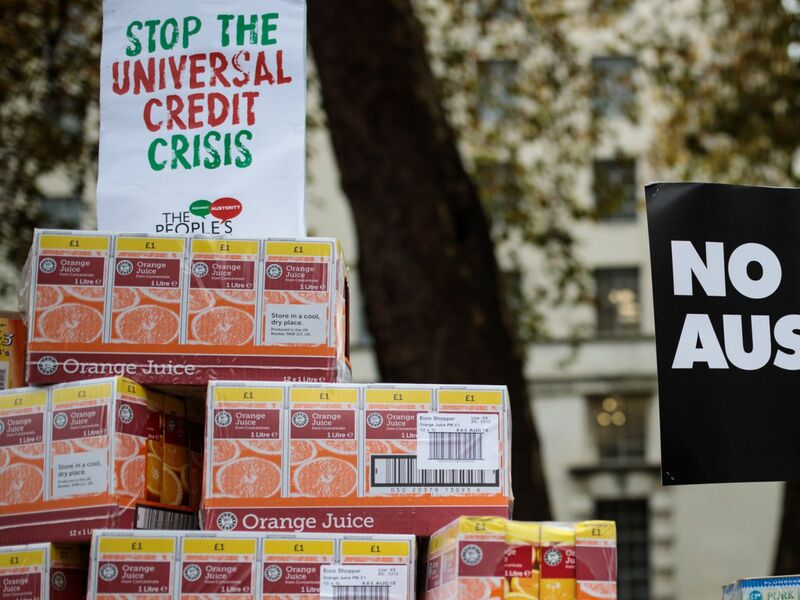 Universal Credit has been widely protested. Meanwhile the avalanche of warnings continues. Universal Credit has left children so undernourished schools are offering free breakfasts, reports the Independent. ‘I was trained to get Universal Credit claimants off the phone,’ says a former Universal Credit case manager in a revealing account of his experience working in its Grimsby call centre for two years. Most recently, an Observer investigation has found that Universal Credit is helping to fuel a rise in homelessness in towns and cities across the country. Campbell Robb of the Joseph Rowntree Foundation (JRF) has called on the government to reform Universal Credit in order to address in-work poverty, which he calls ‘the problem of our times’. The extra £1.7 billion for increasing the Work Allowances of in-work Universal Credit claimants, announced in last week’s budget, will make a difference to many low-income working families, moving an estimated 200,000 people out of poverty. But, says JRF chief economist Ashwin Kumar, so many more could have been helped if the Chancellor had spent an extra £2.7 billion on Universal Credit rather than funding tax cuts that mostly benefit the better-off. 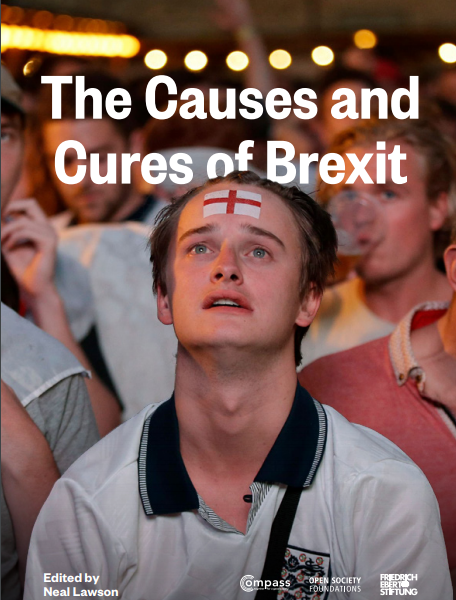 Compass’s The Causes and Cures of Brexit, as the title suggests, poses solutions as well as problems. The report brings together more than 20 short but compelling essays on why people voted for Brexit and what our collective response could be – looking at issues of economy, democracy and culture. Cures include Universal Basic Services and Income, a Green New Deal, proportional representation, addressing immigration at a regional level, and much more. What the responses have in common, say the Compass team, is that they would all ‘answer the call for greater control represented by the vote to leave’. Aidan Harper, writing for the New Economics Foundation, makes the case for ‘a new politics of time’ – harking back to John Maynard Keynes’ famous 1930 prediction, in an essay on ‘Economic Possibilities for Our Grandchildren’, that technological change and productivity improvements would eventually lead to a 15-hour workweek. ‘Is free time a better measure of economic success than GDP?’ he asks. No prizes for a correct answer. According to George Eaton, writing for the New Statesman, the Labour Party is at last embracing a more transformative agenda: worker ownership, universal basic income and a four-day week. And, he says, Jeremy Corbyn was harking back to an even earlier thinker, Karl Marx, when, in his 2017 Labour conference speech, he spoke of how technological advances could enable ‘a new settlement between work and leisure’ and ‘expanded creativity’. In Capital: Volume III Marx wrote of a ‘realm of freedom’ in which labour ‘determined by necessity and mundane considerations ceases’. He suggested that in a communist society, ‘where nobody has one exclusive sphere of activity’, one could ‘hunt in the morning, fish in the afternoon, rear cattle in the evening, criticise after dinner’ without ‘ever becoming hunter, fisherman, herdsman or critic’. ‘Talking Points’ is collated by Caroline Hartnell, who convenes the Rethinking Poverty blog.